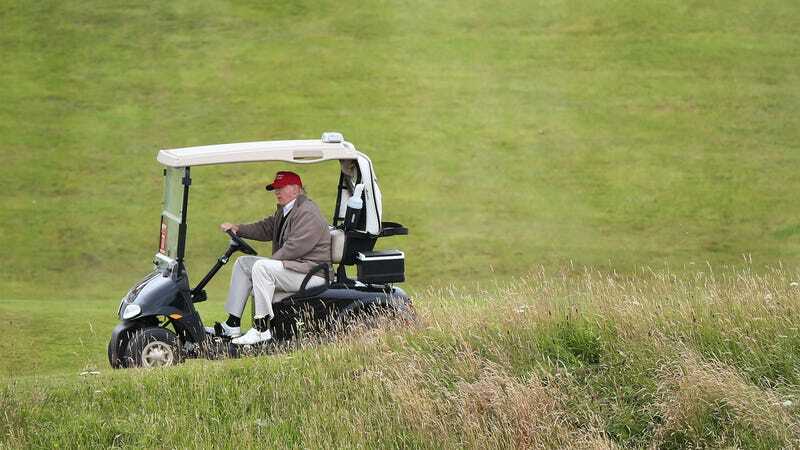 On Thursday, the Irish government approved a permit for a golf course owned by the Trump organization to build a sea wall to prevent erosion, and—at least in the original application—to protect against the risk of sea level rise and extreme weather due to climate change. Environmental groups have long been against the wall, and even managed to scale back its impact when it was found that the original proposal could harm the two-millimeter-long whorl snail, which is protected in the area by European Union rules. Because of the snail’s presence, the Trump organization agreed to break up the wall into two sea barriers, 2,000 feet long and 840 feet long, rather than one continuous 1.7-mile-long structure. The walls will be built with sheet-metal piling and rock armor. Leader of the Irish Green Party, Eamon Ryan, told The New York Times that the party might appeal the decision, asserting that the truncated wall could still damage important beaches, dunes, and grasslands. In May of 2016, a story in Politico revealed that the original application for the sea wall said it would be designed to protect the golf course from “global warming and its effects.” The statement reportedly said that rising sea levels in the region could accelerate erosion. Which is of course ironic, since Trump and his administration have gone out of their way to ignore the current and future effects of climate change, and to undo or prevent any regulations or policies that work to mitigate such impacts. Who knows, maybe when climate change finally does come for Trump’s properties he’ll change his tune. In a mere 28 years, Trump’s Mar-a-Lago retreat in south Florida could be underneath at least a foot of water for more than 200 days a year due to increased tidal flooding, according to the Guardian. Or maybe the Trump family will just turn more to water sports when that becomes an issue.